Timbacore strives in acting at all times with integrity and surrender excellent service to all its customers, by not only selling timber products which are real value for money, but also designing and manufacturing products to customers specific requirements / needs. This is all done to ensure Timbacore is seen and experienced by Customers as a Value-Added company with predefined goals, which is being pursued by all employees continuously. Integrity – Timbacore employees promises to give to you their undivided attention at all times. Commitment – Timbacore is obliged to ensure that all products bought, installed and/or the service delivered always meet the required standard and satisfaction of our customers. Value-for-Money Products – Timbacore strives in delivering products that adds value to all our customers. Client Focus – Timbacore is dedicated to surrender excellent service to all customers, whether selling or designing products, thereby ensuring client orientated services. Timbacore regards its Values and High Ethical (principles of right and wrong that are accepted by an individual or a social group) Standards as priceless assets. Acting with Integrity and adding value in a balanced manner will be the driving force in all interactions with customers, suppliers and staff. The extent to which we meet these commitments will be regarded as our measurement of our success and the long-term value we create for our customers. In addition the pride of our employees in their accomplishments, the satisfaction of our customers and all those with whom we do business, and the extent to which local communities judge our activities as beneficial, will measure our success. Act at all time with integrity and surrender excellent service to all customers by not only selling products which are real value for money, but also designing products that suits customers needs, thereby ensuring client orientated services. 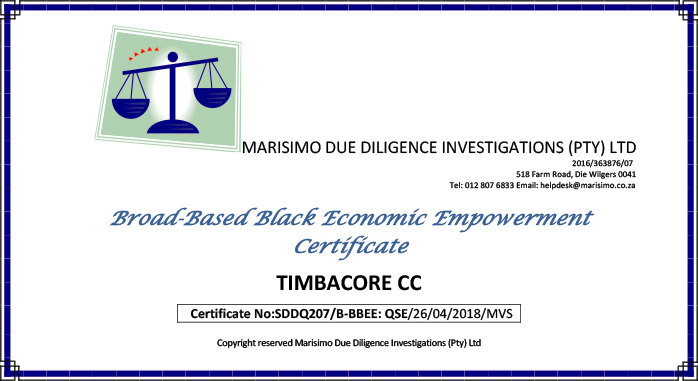 Click on thumbnail below to view Timbacore's complete B-BBEE certification [ approximately 167K ]. Meet the agreed needs and requirements of customers, suppliers and contractors. Giving value for money and services to all customers, suppliers and contractors, thereby ensuring to maximise value to the company. Create growth opportunities and options by having win-win relationships with all our business partners – suppliers, dealers, agents, joint business venture associates. Obtain a sustainable competitive advantage by having committed and competent employees. Build on the diversity and capabilities of all employees. Demonstrate our commitment to being a Company that is seen as being Caring, Responsible and at all times selling 'Value for Money' products.